We had talked about how we can migrate from Outlook Express to MS Outlook manually. In that case, we converted DBX to PST. Here in this article I am talking about the database files in MS Outlook and how to Fix Outlook Data File Cannot be Found Error. Before this, let me share a bit on the difference between OST and PST and why we need conversion. What is the difference between OST and PST? I will make it clear with you in a simple manner. When we configure an Email account in Outlook through POP or IMAP server like Gmail, Yahoo, or Hotmail, the Outlook data file created is PST. Whereas if you are working for an organization and you have your own exchange server setup, Outlook creates an OST file once your configure your email account. You can get all other detailed information about OST and PST on Microsoft’s Introduction to Outlook Data files. Why do we Need to convert OST to PST? There can be multiple reasons why we need to convert OST to PST. In previous scenario, I shared about how to convert DBX to PST, there we had a change in base program. Here, the scenario is different, both OST and PST files are created in MS Outlook. One of the most frequent reasons I get to know during conversion is switching to free email service or migrating to another organization with your mailbox. You do not have the ease to access your Outlook OST file in any computer other then where the file was originally created. Whereas, if you have a PST file in your computer then it can be accessed in any other computer where outlook is installed. If you have an Outlook PST file, you can repair PST using PST repair tool. OST files become more crucial after corruption, therefore if the Outlook OST is corrupted due to any reason on your computer, you need to repair and convert it into PST. If there is a failure on the server end where Exchange server is configured, all the OST files from all the client computers can be converted into PST. PST file can further help to to rebuild Outlook Exchange server. These days there are services like Office 365 that provides us Exchange server on cloud that can be used by us privately. In such cases there are some limitations. More we pay, more storage space we get on the server end. In such scenarios the user enables Outlook pull feature which deletes the mail from server after it is downloaded, to save the disk space. 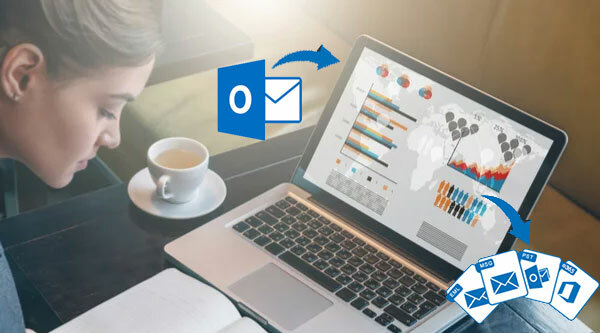 Now if the OST file gets corrupted, you do not have any other option but to repair Outlook OST file and convert it into PST file to access the mails downloaded (Because you did not keep a copy of mail on server). You can perform an archive operation in your MS outlook to keep a backup of your Outlook mailbox data locally. This archive file is created in a PST format. You may check the process in the article where I’ve mentioned the manual process to split PST file. If you landed in any of the situations is mentioned above, the best solution to convert OST to PST is by using a third party tool. Perform a Google search as it is the best search engine among all, and you’ll get many options for converting OST to PST. Don’t get trapped into spam, as there are many fake names available online. I can share a tool that I can rely on, you may consider try OST to PST converter by SysInfoTools. It’s basically an OST recovery tool which converts OST into PST and help you to Fix Outlook Data File Cannot be Found error. I pledge you to try a demo version before you make any decision to buy this tool. Now that you know, what you should do when your OST file is not accessible! I’ve compiled the most frequent problems in Outlook PST and their solutions in an article. you may go through it to solve yours. Using third party tools to perform the conversion process from OST file format to PST file format is the most recommended method. yes indeed ! OST is just a caching format so microsoft don’t treat it as full fledged file format and hence no direct conversion process.